On a whim I bought a tagine at an Emile Henry outlet store in France last year and after trying a lot of different recipes this Lemony Chicken Tagine is now my go-to dish! A tagine is an earthenware dish with a domed lid like a chimney except there is no outlet. Instead it recirculates all the flavor back into the food so you don’t lose anything to evaporation. You can accomplish the same thing in a ceramic cast iron dutch oven but the tagine looks so cool and you can even bring it to the table to serve. Whether you use a tagine or dutch oven you will love this Lemony Chicken Tagine dish! It is seasoned with ginger, cinnamon sticks, saffron and the North African spice Ras-al-Hanout as well as preserved lemons. I would recommend putting the cinnamon sticks in a muslin bag because they tend to fall apart in the cooking and a mouthful of cinnamon stick is not very pleasant. You could eliminate them and increase the amount of ground cinnamon to 3 teaspoons. I also like serving this on the kubaneh bread or pita bread with a yoghurt sauce and pickled red onions rather than the traditional tabbouleh but suit yourself! This exotic one-pot dish is a perfect mix of sweet and spicy. Serve it with tabbouleh or flat breads and a cool yogurt mint sauce. Step 1 Heat a tagine or large lidded ceramic cast iron dutch oven until hot, add the butter and when it foams add the chicken and fry for 2-3 minutes on each side until golden brown. You may need to do this in batches. Remove the chicken from the pan and set aside on a plate. Step 2 Add the onions, garlic and ginger to the pan and fry for 2-3 minutes or until softened. Stir in the spices and cook for one minute, then return the chicken to the pan and stir until the chicken is coated in the spice mixture. Step 3 Add the preserved lemons, honey and stock and bring the mixture to the boil. Step 4 Reduce the heat until just simmering, cover with the lid and cook for 45 minutes. Step 5 Add the sultanas and stir well. Continue to cook for an additional 20 – 30 minutes covered until the chicken is tender and the sauce has thickened. Season to taste with salt and pepper and then stir in the parsley just before serving. 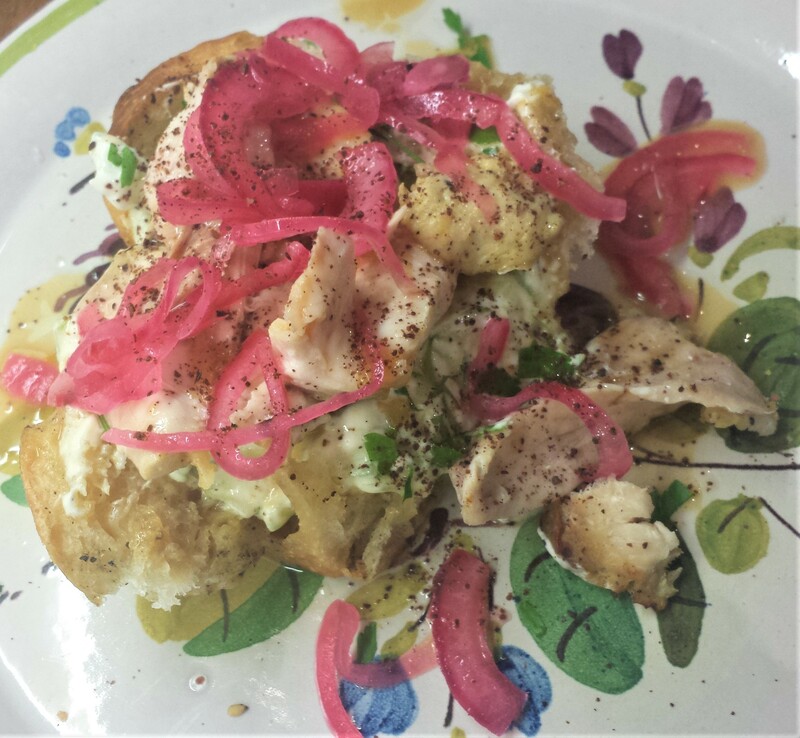 Tear the chicken into chunks and serve on the kubaneh bread, pita or tabbouleh with the pickled red onions and yogurt mint sauce.